Sandwiches don’t need to be just thrown together and boring, spice up your lunchtime with this Cayenne Grilled Chicken and Cheese Sandwich. 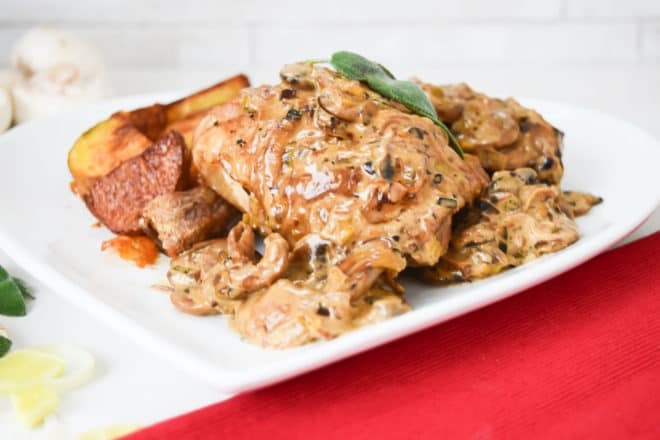 A perfect dinner for guests, this crispy roasted butter sage chicken smothered in a creamy, indulgent sauce tastes like you’ve been slaving away in the kitchen for hours! When in fact, it doesn’t take a lot of time or effort at all! Minty, Summery Chicken? Oh yes please! And Cous Cous? Of course! The minty marinade on the chicken makes it taste so complicated because there are so many flavours, but trust me, it really isn’t! Mix, marinate, cook and enjoy! I love cheese! You can improve the worst days with cheese! My most recent discovery in the cheese aisle is Taleggio. It lives somewhere between Brie and Stilton and is amazing with chicken! So I thought why not combine the two in a bready, crunchy, crumb heaven?! So simple!